BHM Medical Floor Lifts provides ergonomic design and manoeuvrability. A perfect solution for safe and comfortable transfers in the comfort of your own home. Which fits your needs better? A Passive lift or Sit & Stand? 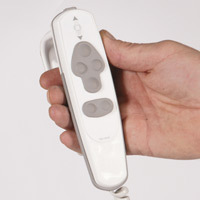 The Passive lift allows complete lifting for all types of patients. The Sit & Stand lift requires a minimum of physical strenght from the patients. The Junior foldable, mobile floor lift handles all conventional lifting situations then compacts for storage under the bed or behind a door. The Junior foldable lift is the ideal combination of function and convenience. The Graduate, compact in design it as the power and range to cope with nearly all lifting situations. The Graduate is well suited for a home care environment. 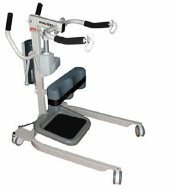 Looking for a high quality, floor lift that can lift up to 400 lb (182kg)? With its ergonomic shape, easy manoeuvering capability and outstanding features the Ergolift-II is the perfect floor lift equipment to use at home. Need a higher lifting capacity? 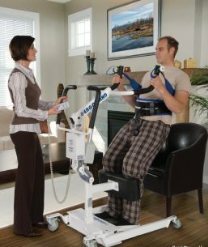 TheErgolift 600 handles patients up to 600 lb (272kg). Plus its wide opening base allows easy access to wider bariatric chairs. 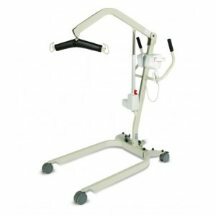 The Ergostand is for patients with some physical strength. 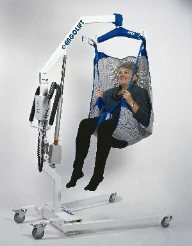 The Ergostand is the safiest and most efficient way to dress, clean and transfer patients who need additional support. The Ministand is a safe and convenient method of providing standing, sitting and toileting assistance and an efficient way to dress, clean and transfer individuals who requires some additional support.